The "School of Rock" is the tale of a loser who bluffs himself into an upscale school as a substitute teacher and turns the kids into rock stars. Before the show starts we hear the recorded voice of Andrew Lloyd Weber, who wrote the new music with Glenn Slater writing the lyrics, assures us on tape that the kids are really playing their instruments and do they play them. Mystic Inscho owns the electric guitar while Cameron Trueblood seems to have learned from the masters how to beat the drums. Julian Brescia works magic on the keyboards, Leanne Parks plays a bass almost as big as she is and each time stops the show with her solos. Arianna Pereira and Alyssa Emily Marvin as back up singers are soon joined by Camille De La Cruz who is a shy girl until she belts out an "Amazing Grace" and then she owns the stage. They are joined by other students such as Sami Bray who becomes the band's manager because she knows she is the smartest kid in class while Sammy Dell, the gay kid, is the costume designer, Jacob Moran is made the security guard and Gabriella Uhl becomes a roadie because all the kids in the class have to become a part of the band. I don't know how old the kids are in real life but on stage they are in the 4th grade which would make them be 9-10 years old and I suspect a few may be in their early teens but it makes no difference as they definitely know what they are doing! How do adults compete with such talented kids? As best as they can and Merritt David Janes, as the fake teacher, does everything possible from jumping up on tables, rolling all over, singing, playing guitar and he stays just a step ahead of the kids. The other adults really don't have that much to do with the exception of Lexie Dorsett Sharp, the principal of the school, who finds her youth again in a plaintive ballad "Where Did The Rock Go?" Aside from the aforementioned ballad the kids sing a beautiful song "If Only You Would Listen" which not only delves into who the kids are but what all kids want to say to their parents. 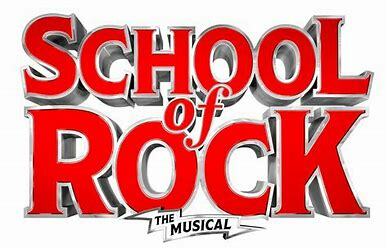 The three rock songs, two by Webber and Slater "Stick It To The Man" and "You're In The Band" plus the "School Of Rock" by Mike White and Sammy James Jr., from the film of the same name which the show is based on, exemplifies the music the show is about. The sets, costumes, lighting and direction are all first rate with the choreography basically the kids and Janes jumping up and down but that's what rock is all about, including the audience swaying back and forth and clapping along with a couple of the songs. The only thing missing was people lighting lighters or turning on their phone flashlights!